Bathoro Katong grave is located in Sentono village, Jenangan district, about 2 km to the east from the centre of the city. 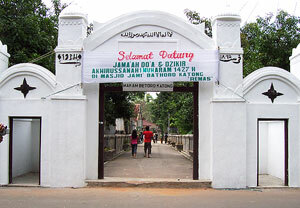 Bathoro Katong was the founder and the first Regent of Ponorogo and also the leading figure of the disseminator of Islam religion in Ponorogo. He was the descendants of Brawijaya King from Majapahit and Raden Patah Brother from Demak kingdom that was the first Islam kingdom in Java. In this funeral complex was also buried the other leading figure of Ponorogo, that is Patih Seliaji and Kyai (the religious teacher) Ageng Mirah. In certain time especially in Suro month and Ruwah (the Javanese calendar), in Bathoro Katong funeral complex is often visited by many pilgrims who want to pray for the soul who was buried. This funeral complex is also believed by many people as the effective place to pray, because of that, this place was always busy by the visitors who have pilgrim. The location is in the foot of hill in Badengan district about 15 km to the west from the centre of the city. That was buried the Regent Sumoroto and his descendants. It is often visited by the pilgrim on Tuesday Kliwon. Jayengrono grave was the son from Haryo Mataundari Kasunanan Surakarta. Whereas his mother was the descendants from Bathoro Katong. Narrated when he opened the forest, he found 'pesing' (smelly that spread) flavoured citrus fruit, so as the area named the Jeruksing. Further he moving to the east that now named Pulung. This area became the perdikan village. The grave of Merto Hadinegoro Tajung was located in the Tajug village. Here in buried R. Adipati Mertohatinegoro. The first Ponorogo regent in the Middle city, he is Jayengrono and Bathoro Katong descendants. was the old mosque the legacy of Kyai (the religious teacher) Muhammad Besari that it seems was the descendants from the Prophet Muhammad SAW. In the mosque had studied a person named Mas Burhan that in the future was known as Raden Ronggo Warsito, of a big poet from the Surokarto kingdom. This mosque was located in the Jetis district. was located in the Mlarak district, was the first modern hut and the biggest in Indonesia. Known nationally in fact to be international.